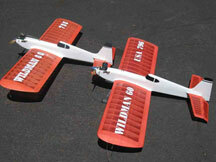 All items posted here must be related to control-line model airplanes. All transactions are between the seller and the buyer; Flying Lines is not responsible for verifying claims made in classified ads or arranging transactions. Make sure to notify the editor if your item sells, so that we can remove the listing. If you try to respond to an ad and find that it is no longer valid, please notify the editor. Updated March 28! HUGE CL SALE: Engines, kits, tanks and all kinds of control-line model accessories. Download the list. To order, email Mike Hazel. AVIATION BOOKS: Model Aviation Hall Of Fame recipient Dave Gierke has a new two-volume aviation book … and he’s making it available at a special introductory price to all Control-line modelers. Order by going to Dave Gierke's website. Download flyers on Book One and Book Two of "To Caress the Air." ENGINES WANTED: Looking for one or two Nelson .36 engines to buy. Please let Jeffrey Cohen know if you know of any for sale. STUNT PLANE FOR SALE: Shark 45, flown about 10 times. Irvine .46 engine with hemi head by Byron Barker. Trimmed and ready to fly, in great condition, $250. I'm not flying much and a .60-size ship is a little much for me. Pick up or meet in Portland-Salem area. E-mail Greg Hart. ENGINES WANTED: Nelson .36, .41, .21 and .19. E-mail George Voss. ENGINES AND PARTS FOR SALE: Download a list and e-mail Orin Humphries for ordering info. STALKER ENGINES AND OTHER STUNT PRODUCTS: Tom Dixon has the full line of Stalker engines plus kits, wings, plans, props and hardware. For details and to order, see Tom Dixon's Model Airplanes website. BEWARE STOLEN KITS: Don Chandler of Red Bluff, Calif., reports that a large number of scale model kits were stolen from a storage unit on Aug. 28, 2015. Several Top Flight kits, Sig J-3 and a Douglas Skyraider. If you or anyone sees this stuff being sold, please contact Don Chandler. CONTROL LINE BUILDING SERVICE: Complete frame up of these four classic designs, The Original Tutor, The Magician, The Flite Streak and the OT Ringmaster. Available in take-apart or permanent configuration. Will build for electric or glow power. For pricing and details please e-mail Mike Griffin. FLYING FOOL PLANS: Scratch builders may enjoy this reproduction of the plans for the classic Sterling kit. Plans are sent on a CD and can be taken to a print shop and printed out actual size, smaller or larger. $20. E-mail Frank Balkus for information. FAST HIPPY SPEED PRODUCTS: Marty Higgs provides, among other items, C Speed tanks ($20), C Speed torque units ($25), elevator control systems ($15), (all three as a kit, $60); HI-G titanium bellcranks ($35); HI-G steel bellcranks ($25); F2D Proto micro bellcranks ($20). Will build any size custom torque units, 1/2A to Jet-D. E-mail Marty Higgs. TYME : Custom-made venturis and mufflers. Scott Riese, (503) 246-4631. E-mail for info. OLD MAGAZINE PLANS ON CD: I will make the offer to search my database of about 4,000 magazines to help anyone find the plans for models published by the magazines. CDs of plans are $10 each. Anyone can contact me direct by e-mail for more information on CL modeling data on CD. Thomas Wilk. Also available: Control-line cartoons on CD. PLANS FOR SALE: Arctic Fox (white plane), designed for a Fox 35. Short kits $65. The plans for scratch building this plane cost $8. Grinder (red and yellow plane): Designed and drawn by Leo Mehl, traced and inked by Bob Sweitzer, top quality plans, $15. Contact Leo Mehl at (503) 255-6471 or e-mail Leo Mehl. HOBBY SHOP: Tri-City Connection, CL and RC supplies, new and used. Lots (1 ton truck full) of old magazines (50's and newer) for sale $5 each shipped. Let me know what your looking for. Model Builder, Model Airplane News, RCM, Flying Lines, RC Scale, etc. Telephone (509) 542-1959 or e-mail David Miller. RACING SUPPLIES: The former Kustom Kraftsmanship line of quality racing equipment is now available from Darrell Albert. Available supplies include button bellcranks, Cox competition and generic parts, wheels, lines, shutoffs, landing gear and many other items. E-mail to place orders or get more info. 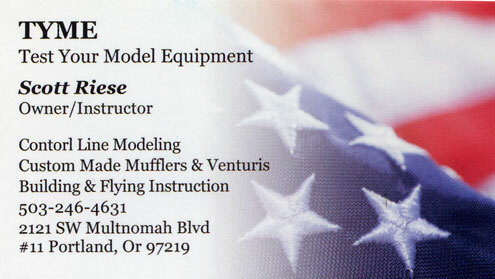 FREE PHOTO CLASSIFIEDS: Northwest flies can display the items they have for sale on this page. Just e-mail the ad and the photo to the editor! See terms below. To place an ad on the Flying Flea Market, e-mail the text and photo to the Flying Lines editor. Ads are free to Pacific Northwest fliers. Donations are accepted to help cover the cost of maintaining the web site. Control-line related advertising will be accepted from non-Northwest modelers as space allows. Ads for non-NW modelers are $1 per month. Contact the editor for details. See below for more information on donating to Flying Lines. To donate to Flying Lines for listing your classified ad, you can make a donation by PayPal. Just hit the button below.